Many people are concerned with all the devastation they see around the world. Between mass shootings, floods, fires, famine and poverty, people are getting bogged down with simple survival or the fear it creates. Some people can travel to remote locations and physically help. Others will send money to help. But even if you can’t do either, you can still really make a difference. Through quantum mechanics and quantum physics, science is now proving what spirituality has always believed – That we are all connected. If this is true, then your thoughts and feelings can contribute to the outcome and experience of others. When you see devastating news streaming across your TV or Facebook feed, take the time to send loving, supportive thoughts to those in need. Don’t get caught in the hate, judgement and fear. This just makes it spread. For those who believe in prayer it is nice to say a quick “help them out God” But remember, we can help too. You personally can help make a difference. If we are one humanity, then let’s start to take some responsibility for what we contribute to the cosmic mind field, our collective consciousness. The seeds of hate and fear create the mass shootings and violence around the world. But if we are all connected then let us look to our own seeds of hate and fear that we each feed into the collective energy. Isn’t it possible that the growing cloud of hate and condemnation is building and those who carry the most just vent the collective cloud of brewing emotions? Let’s not criticize, judge and condemn others. How about we just look inside ourselves, our family relationships, and our neighbourhoods, and ask ourselves if we are contributing to the negative emotional buildup that is creating these horrible situations. It is not a reasonable expectation that we individually can change the whole world, but we can certainly change what we are contributing to the collective consciousness. What a great movement we could create with the belief that “World Peace Starts With Me”. If everyone believed this and worked toward creating minds and hearts filled with peace, how long do you think it would take for us to see Global Change in how we treat each other? 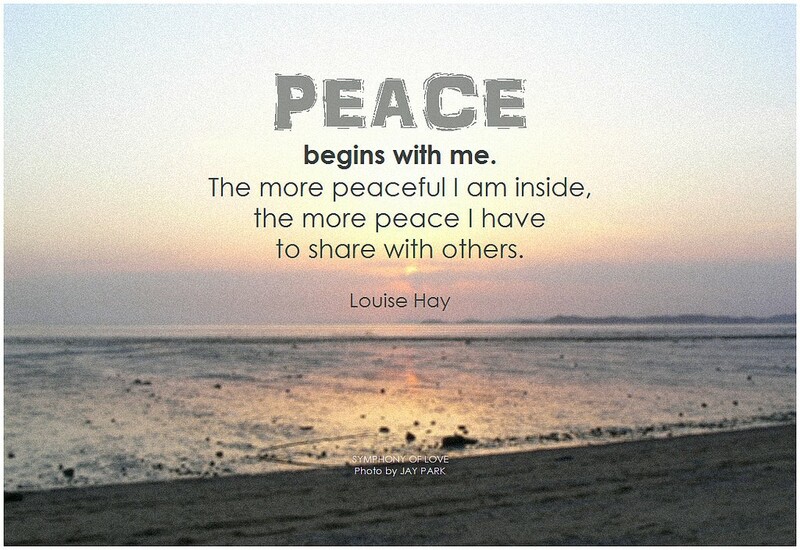 Join me, lets make a personal commitment to the belief “World Peace Starts With Me.” And use it as our daily checkpoint in all we do. I believe it will make an incredible difference to you personally and your family, and then it will spread. Soon people will be venting uncontrolled bursts of joy and happiness, and wouldn’t that be lovely to watch! “But where was I to start? The world is so vast, I shall start with the country I knew best, my own. But my country is so very large. I had better start with my town. But my town, too, is large. No, my home. No, my family.